Finally, A Bill Of Rights! - Neighbors at War! Finally, A Bill Of Rights! 1 Comment on Finally, A Bill Of Rights! Wow, it looks like Jonathan Friedrich (the best friend a Nevada Homeowner ever had) has been busy since his appointment to the state Comittee which oversees Homeowners Associations. I include his proposed Bill of Rights below just because it deserves to to be talked about. My only objection is, “We have these rights already! Somebody just found a way to take them away by fiat! All we need is a frickin’ rule that says Homeowners Associations are ALL government agencies and can not organize as private non-profit corprorations. THAT’S ALL! No Homeowner shall ever have his home or land foreclosed upon by a Homeowner’s Association for non-payment of fines, delinquent monthly Homeowner Association fees (regular assessments) or for non – payment of special assessments. The Association will be permitted to place a lien on the property until the unpaid fees are brought current, but may not foreclose on the lien. The legal costs shall be borne by the delinquent homeowner. a)120 days after notice of approval of a Special Assessment to make one payment if $750.00 or under. b) Any amount over $750.00 shall not be required to be made in no fewer than 3 equal payments, with the first payment due no less than 120 days after notice of approval of the Special Assessment with no less than 60 days between payments. with no less than 60 days between payments. thereafter, with no less than 60 days between payments. format, CD or DVD, to each buyer. All Homeowners shall be allowed to speak at HOA Board Meetings on any agenda item being discussed during the meeting. A minimum of 5-minutes must be allowed for each Homeowner’s comments per topic. Homeowner’s who cannot attend the meeting in person may submit their comments to the Board, to the Board President, or to the Property Manager or Executive Director by fax , U.S. Mail or e-mail, so long as it is delivered no later than 24 hours prior to the start of the Meeting. Comments submitted shall be read by a Board Member prior to or during the live oral comment period on the topic which is the subject of the Homeowner’s comments. If the comments are lengthy, the duration of reading may, at the option of the Board, be abbreviated / truncated to 5 minutes per-comment per-topic. However, the comments must be summarized in as faithful and accurate a manner as possible, to convey the Homeowner’s intended expression. All comments presented, either orally in-person, or in writing, must be heard prior to putting the subject or agenda item to a Homeowner or Board vote. Interest shall not accrue on any unpaid fines. A maximum interest rate of 5 percent (simple interest) per-annum may be charged on unpaid monthly fees beginning 60 days after they are assessed. An interest rate of 3 percent may be charged on unpaid Special Assessments, beginning 90 days after they are due. For any Homeowner with any unpaid fine(s), delinquent or unpaid assessment(s), or unpaid fee(s), a statement must be mailed via certified mail, with return receipt to that Homeowner’s mailing address of record at least every 60 days. (The costs of mailing may be charged to the Homeowner’s account). Failure to mail a statement by the 70th day will void all fines and interest imposed by the Association. The Office of the Ombudsman shall be empowered to resolve disputes between Association Boards, Property Managers, and Homeowners. The Ombudsman shall be vested with the power to impose fines in the amount of not more than $100 per-occurrence and not more than $400 in total fines against any single homeowner, or not more than $2,000.00 per-occurrence and not more than $6,000.00 in total fines against any Board or Property Manager within any Two-year period, measured from the date of the Ombudsman’s decision the first offense. has committed Three (3) infractions within any Two-year period, measured from the date of first filing with the Ombudsman’s Office, and having been found guilty of infractions of either the Governing Documents or of State Statutes or Codes that govern Common Interest Communities, shall pay an additional fine in the sum of not less than Two Thousand Five Hundred Dollars ($2,500.00) to the Office of the Ombudsman. In the case where a Board Member, Property Manager or Executive Director has committed willful Violations, a breach of any fiduciary duty, or acted with malice or gross negligence of their duties, they shall be personally liable to pay the fines and shall not be defended, reimbursed, or indemnified from or by the Association, or the Association’s insurance carrier. Upon such finding, the Board Member, Property Manager or Executive Director must reimburse to the HOA or insurance carrier all costs of his or her defense. fees to any prevailing Homeowner. bad faith and was motivated by an improper or vexatious purpose. Homeowner Boards shall not be allowed to hold hearings concerning alleged violations of the Association’s governing documents. Only Fact-finding sessions that are open to all the other members of the Association shall be held. The facts found shall be used by both or either party and submitted to the Ombudsman’s Office to substantiate their claims. the Owners in the Association vote in favor thereof by written ballot. written ballot any changes to the Governing Documents. Homeowner, Prior to the Board’s Vote on the issue before them. option of the Association Member. 12. All members shall receive a copy of the previous year’s Financial Audit / Statement at the annual Homeowners Meeting or, if not in attendance, any homeowner may request a copy be sent by either U.S. Mail, by e-mail, or to be picked up at the on-site administrative office or designated common area facility (e.g., office or clubhouse). Bank Statements, Bills Paid and Unpaid, Invoices, Quotes, Estimates, Contracts, both Past and Current, and Attorney/Legal Invoices, during normal business hours at the office of the Property Manager or Community Administrative Office. No charge shall be made for any Homeowner, or his or her representative to review these documents. or such facts as should be known upon reasonably diligent inquiry, and under the Business Judgment Rule. When considering Budgets, Reports dealing with Construction Defects, Infrastructure repairs or replacement, Equipment repairs or replacement, Reserve Studies, and Reserve Assessments, a Board must have thoroughly reviewed and analyzed any bid, report, and/or study prepared by a Professional knowledgeable in the area under consideration prior to adopting or ratifying it. In light of the Board’s fiduciary duties to Homeowners, wasteful, redundant, and excessive expenditures should be avoided. While the lowest-cost approach is not always required, the Board should seek foremost the “best value” for the homeowner’s and give due consideration to the financial hardships which might be imposed on homeowners, to be balanced against the beneficial effects of the expenditure on homeowners. My comments, Jonathan: the lawyers will savage you. CAI will slime you, you’ll soon fine that it’s impossible to keep all your tires inflated (the nails will just pop up at the most inconvenient times. There might even be a death warrant out for you by some of the dozens of Las Vegas Crooks who are on their way to prison because of their own graft and corruption. Keep you head down and your powder dry! But don’t stop what you’re doing. Johnathan and I both represent homeowner interests on the Nevada Governor-appointed Commission for Common Interest Communities and Condominium Hotels. 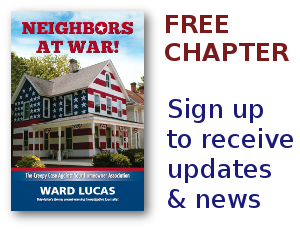 While the homeowner bill of rights seems like it should be a non-brainer concept, even more basic is that Nevada Legislators are unwilling to discuss clearing up the fact that the US Constitution applies equally to HOA and non-HOA citizens of this State. It will be impossible to establish a meaningful HOA owner/resident bill of rights if there is no state government agreement that HOA owners and residents are CITIZENS in the State of Nevada as described by our US and NV Constitutions! Imagine that the real estate laws demand that there be full disclosure of all limitations associated with a property for sale, but the government fails to require disclosures that HOA buyers are signing away their basic Constitutional rights when accepting the CC&Rs! I would have never accepted the sales contract if I had known at that time how I was supposedly giving up my Constitutional rights to equal justice under the laws of NV!